Weekly sale ads: don’t exist. There are no ads because there are no sales, at least on groceries. The price is the price. Storage: useful to the extent that it keeps you from having to shop every single day, but without major price fluctuations, there’s not much incentive to stockpile. Coupons: luckily I don’t rely on them, because coupons are also Not a Thing. So to sum up, the frugal and efficient grocery shopping strategies that I’ve spent years perfecting? Completely useless in Mexico. As I very quickly discovered, American-style shopping would be needlessly expensive. Wal-Mart, for the record, didn’t have the best prices on any item of food on the long list I checked. If I ate meat, then I’d be adding a carnicería to the list. 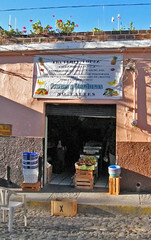 Another little tienda sells bulk grains and spices. Need bread? Find a panadería. And so on. Then you have the weekly markets, or tianguis (pronounced tee-AHN-geese). 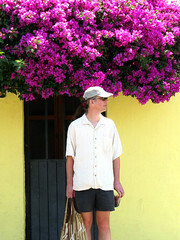 The largest one, every Monday in nearby Chapala, is kind of like a farmers’ market crossed with a flea market. In Ajijic, the tianguis is on Wednesdays, and is partially aimed at tourists: less food, more arts and crafts. 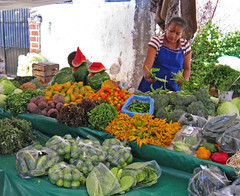 The Chapala tianguis had the best prices on produce — but only if you buy large quantities at once, like two or three kilos (five to seven pounds). For large Mexican extended families, I assume this makes perfect sense; when I’m feeding just two people, seven pounds of anything perishable is a waste. There are also little corner groceries, much like New York City bodegas, here called abarrotes. Like convenience stores everywhere, they have only the most popular staples, in small quantities and with higher prices. I used them only in a pinch. So every two or three days, I’d go out and make the long circuit of the fruteria, the pescaderia, and so on. I definitely spent more time at this each week than I do at home, but I mostly didn’t mind. So how expensive is food in Mexico? Can we really eat there even more cheaply than we do here in the States? Oh I’m pretty sure you’ll come up with new strategies for a frugal grocery shopping in Mexico. Which a mexican like me will find very useful. Well, but in the meanwhile you can enjoy a nice walk, practice your spanish and learn how to “regatear” which means “negociate” with the “marchanta” -female or “marchante” -male (this only applies in the market or in the streets though). Hope you enjoyed your time in México. Ha, thanks for the vote of confidence! As a Mexican, if you have any advice for negotiating, I’d love to hear them. My experience, confirmed later by other long-term expats, was that negotiating is acceptable for certain things, like arts and crafts, but not so — and maybe even a faux pas — for food items, even in the tianguis. Great!, I´m sure that in a few months your spanish will be very good and you will be able to understand a lot!! I was thinking about some tips or advice when shopping, but the only one I can think of is, for example when I´m in the market I always look around and ask for some prices, and then I´ll go with the one that has the best stuff at the best price, also check which store (“puesto”) has more customers waiting in line… usually those have the best prices. I guess once you get familiar with the “puestos” you will be able to notice which ones are the best in terms of price, service and products. Good luck! !